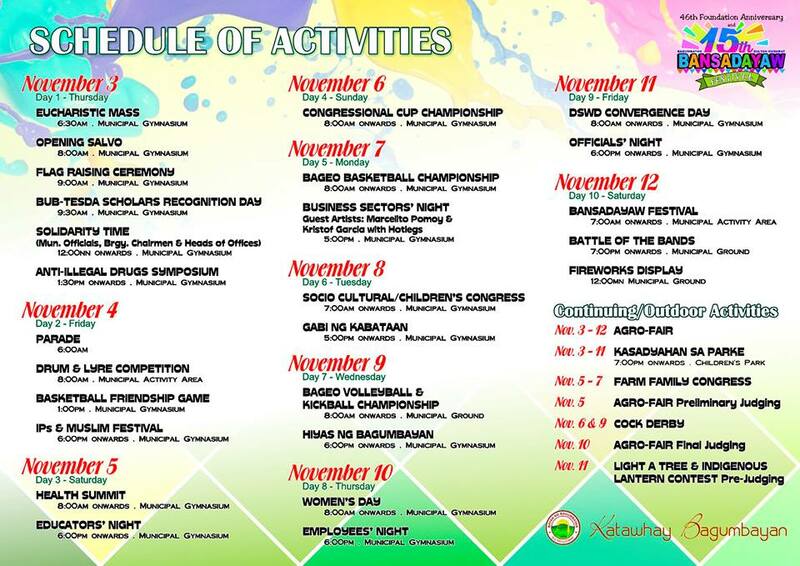 Every month of November, the people of Bagumbayan in the Province of Sultan Kudarat celebrates their town's founding anniversary with Bansadayaw Festival, a week-long celebration highlighted by merrymaking and showcase of their diverse culture. Bansadayaw was derived from "bansa" an Ilonggo word which means in full view, and “dayaw” which refers to merrymaking. Activities during the celebration includes sports and talent competitions, pageantry, agro and trade fairs, celebrity concerts, street dancing and many more. We've learned about Bansadayaw Festival during the "battle of festivals" or street dancing competition of Kalimudan Festival of the Province of Sultan Kudarat last year wherein the contingent from Kapaya National High School which represented Bagumbayan and Bansadayaw Festival was declared the over-all champion. We're amazed with their lively performances during the street parade and showdown competitions and noticed their colorful costumes. Can't wait to see more of Bansadayaw Festival this year in Bagumbayan!